Thanks to a technical grant by the National Renewable Energy Laboratory (NREL), Brian Newton, Fremont general manager of utilities, hopes to establish a five-acre community solar farm with the potential to generate 1.7 million kilowatt hours per year, enough electricity to power, on average, 140 homes. Newton discovered the NREL grant at an ideal time. Earlier this spring, he met with the Fremont Board of Public Works to discuss various aspect of strategic planning in the city of Fremont. A focal point of those discussions arose from the city’s efforts to diversify the resources it uses to generate electricity. Read the entire article here. Image: Central City 200-kilowatt solar farm developed by Cliff Mesner. If developed, the Fremont solar farm would be significantly larger, as described above. Courtesy photo. 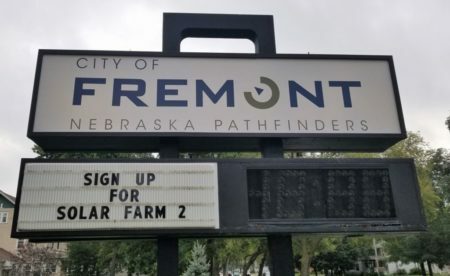 This entry was posted in Community-Scale Solar, Nebraska / Midwest News, NewsBlog and tagged community solar development in Nebraska, Developer Cliff Mesner, Fremont Solar Farm, Fremont Tribune, National Renewable Energy Laboratory (NREL), Nebraskans for Solar on May 19, 2016 by Helen Deffenbacher.